The spinach diet is a straightforward approach to incorporating one of the healthiest, nutrient-rich foods available into your daily meal planning. Spinach is packed with essential vitamins that offer many health benefits. A variety of spinach types help keep your diet from becoming mundane and monotonous. You can also add spinach to a variety of healthy meals as a side dish. Spinach is low in calories and packed with vitamins and other essential nutrition. Just one cup, or 30 g, of spinach provides you with vitamins A and K, manganese, folate and magnesium. There are only about 26 calories in 100 g of spinach, depending on how the spinach is prepared. Other significant nutrients in spinach include the minerals calcium and potassium, the vitamins beta carotene and lutein and various amino acids -- essential building blocks of protein. Spinach is an ideal food to eat if you are trying to lose weight because 1 cup is so low in calories, but provides significant nutrition. Spinach has double the fiber of other leafy green vegetables, which helps promote weight loss. While there are no specific guidelines for how much spinach you should eat every day on a spinach diet, consuming 2 to 3 cups a day provides you with ample nutrition without the calories. 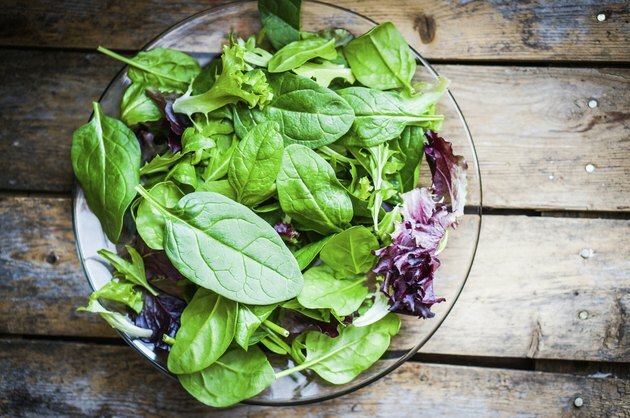 How and when you eat your daily servings of spinach is completely up to you. You can eat the spinach raw, by itself, steam it or make it part of a healthy meal. Spinach is full of antioxidants that kill off free radicals. This has made spinach a favorite food for doctors to recommend to patients concerned about cancer. The more than a dozen flavonoid compounds that compose the antioxidants work together to neutralize free radicals, which can help reduce the risk of developing certain types of cancer. The magnesium and beta carotene combine to promote cardiovascular health. Magnesium regulates blood pressure levels, while beta carotene impedes oxidation of cholesterol -- a process that can lead to high cholesterol levels. Spinach also helps slow down the aging process by encouraging increased brain function. There are three basic spinach types: savoy, flat and semi savoy. The flat spinach is typically easier to clean than the curly savoy leafed spinach. All spinach types are easily incorporated in daily meals if you find yourself getting bored with eating spinach on its own. Ensure that the foods you pair spinach with are also of a healthy variety to not counter the benefits of spinach. Spinach is ideal for various salads and can be added to omelets. You can also top your sandwiches with spinach leaves and stuff them into your veggie wrap. Darker green-colored spinach packs more nutrients than the lighter green color. Antioxidants Guide: What is the Health Benefit of Spinach? Just Ask Popeye! Do I Need to Cook Spinach Before I Put it in a Lasagna?